Our Tripawds Spokesdawg Wyatt Ray has become quite the role model for three-legged dog fitness. But he didn’t get there overnight. After his amputation it took months for him to rebuild strength. Try Wyatt’s starter exercises for Tripawds. A rehab vet once told us something very important that you must remember: walks do not build strength, only endurance. More frequent much shorter walks are preferred at first. But core conditioning and weight bearing exercises are a must for improving strength and building muscle. Today, we just want to show you this quick clip about Wyatt’s newest exercises. Look at how strong he’s become! In this video, Wyatt is balancing on a FitPAWS Donut. See how his weight is on that rear leg? He is using his core muscles to stay balanced while Rene is making him reach from side to side. NOTE: We always recommend consulting with a certified rehab therapist for a professional evaluation and homework exercises you can do at home. Once your Tripawd has healed and the stitches are out, you can start with some basic balance exercises and stretches for dogs. Soon we’ll follow up with Tripawd Cat Exercises! From a standing position, have your dog sit, then lay down, then sit, and then stand back up. Repeat this no more than five times at first. A couple times a day will be plenty of exercise. 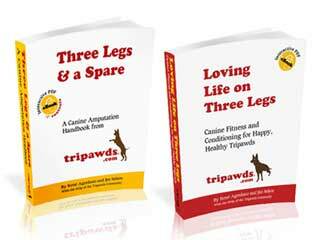 Learn more ways to keep three legged dogs fit and strong in the Tripawds e-books. Got questions? Download immediately for fast answers! With your dog standing, use a treat or toy to encourage him to stretch his body upward toward the tail. Do this for both sides and repeat. Do this three to five times on each side, working up to 10 (but go slow!). You can also practice this while your dog is laying on a firm surface. Be sure to reward every effort. The term “proprioception” is the mind’s awareness of the body’s position in space. After the amputation, your dog will need better proprioception in order to adjust his stance and his gait to compensate for the missing leg. There are various PROM (Passive Range Of Motion) exercises you can do to help. But you can start, simply by playing with his toes. Wyatt hated this! But by gently spreading his toes and patting at his feet so he would move them while standing up, he quickly learned to become more steady on his feet. Get your dog to stand in place while gently pushing her slowly from side to side. Do not force her completely off balance. You don’t want her falling over. You just want to notice her legs and core muscles tightening as she tries to remain upright. Blocking your dogs path and walking forward can force her to hop backwards — another easy challenge to help improve balance and confidence. FitPAWS makes some great canine fitness equipment, but you really don’t need to purchase anything for your first exercise routines. Take the cushions of your couch and lay them on the floor. Have your dog walk back and forth across them a few times. As your dog gets stronger, you can stack a couple cushions and have her stand on them while stretching like Wyatt did in this video. If you are handy, you can make your own Buja Board for doing some fun balance exercises with your dog. Simply by standing on a wobble board, your dog is developing core muscle strength. You can download free Buja Boad plans to make your own. And you will find much more helpful information about swimming, stretches, and exercises to keep your three legged dog fit and healthy in the Tripawds e-books, or by searching the blogs and forums. Don’t just take our word for it. Watch the above video with canine physical therapist Dr. Laura Hady. She explains how the exercises help, and demonstrates the board with Wyatt and Max, a Rottweiler missing his front leg. Whatever you do to help your dog, please be sure to start slowly. Perform a few quick exercises a couple times a day and you may soon notice a remarkable improvement. When it comes to rewarding your dog for putting up with your crazy exercises, use lots of praise, a favorite toy, or a low-fat treat. Fruit and vegetable pieces are much better than cookies — Wyatt loves green beans and carrots! Weight management is extremely important for keeping your Tripawd fit and strong. 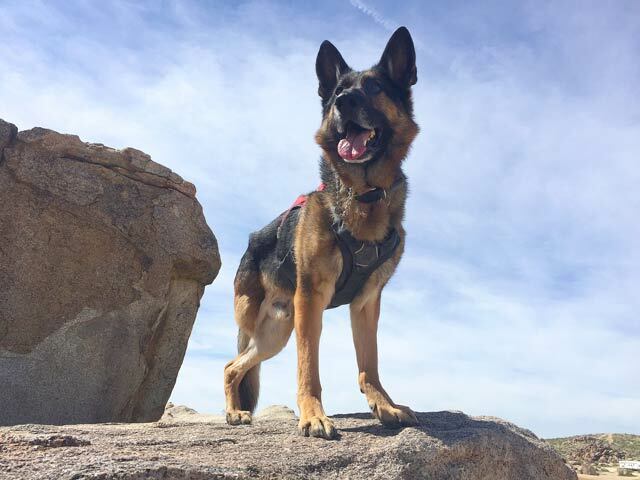 When it comes to exercise, our best advice is to consult with a certified canine rehab vet tech for a professional evaluation and some fun exercises you can do at home. Thanks to the Maggie Moo Fund for Tripawd Rehab, you may even get reimbursed for your first visit from the Tripawds Foundation! Will my dog ever swim again? In this short video Wyatt proves it, Yes! A Tripawd can swim just fine! Swimming is fantastic therapy, but it is most effective when enjoyed as part of a comprehensive canine conditioning program. Pay attention to the note in that video that explains how Wyatt swims so well thanks to proper nutrition and rehab exercises. Download Loving Life on Three Legs for more helpful tips! Get Tripawds E-books for fast help! Watch The Tripawds News Blog for Tripawd Cat Exercises! Thank you so much for these great suggestions. I’m a volunteer at our local Humane Society and we get quite a few tripawds in. Some are new amputees who need to learn to adjust. It is wonderful to see these dogs find their forever homes. We have a strong enrichment program in our shelter. Many of the enrichment puzzles, toys, and so forth we use with all our dogs will be great for tripawds, too, but I’m wondering if there is anything special you would recommend for enrichment for these wonderful dogs, especially for those who are in the early stages of recovery from surgery. They are housed in nice habitats but it is no substitution for a loving home. Boredom is the enemy! Many thanks. Betty thank you for the great work you do at the shelter. As for anything special during recovery, yes we do have ideas! Check out our interactive games and puzzle ideas. Many can be made with ordinary household objects so the shelter doesn’t have to spend a lot to keep them entertained. As an aside, be sure to let the shelter know about the Tripawds Foundation Rescue and Rehab Reimbursement Funds, so they can let prospective applicants know when a Tripawd is up for adoption. Thank you! Which harness does Wyatt have on in these videos? Wyatt is wearing the Tripawd Convert Harness by EzyDog in the first video, doing exercises on the Donut. In the weight shifting exercise and buja board videos, he is wearing the Ruffwear Web Master harness. In the first photo, he is wearing the Web Master Plus. And in the swimming video, he is wearing a Ruffwear Float Coat. Find details about all these products here. LOVE, LOVE, LOVE!!!!!!!!!!! LOOK at how strong Wyatt is now thru all your hard work! Love you guys!